In May of this year, the J. Craig Venter Institute (JCVI) announced it had created the first fully synthetic, self-replicating bacterial cell (Mycoplasma nycoides JCVI-syn1.0). While this proof-of-concept demonstration of an “artificial life form” might raise justifiable fears about the dangers of unregulated or nefarious synthetic biology efforts, in fact the bioindustry has for some time been forging ahead with globally and commercially meaningful applications. This fall, JCVI along with Synthetic Genomics (SGI), which was co-founded by Craig Venter and Hamilton Smith, formed a new company named Synthetic Genomics Vaccines. The vaccines company has signed a three-year collaboration with Novartis to create influenza seed (starter-culture) strains for large-scale manufacture of flu vaccines. The intention is to reduce vaccine production time by having a bank of synthetically produced seed viruses; this should accelerate production of flu vaccines for seasonal or pandemic applications instead of relying on WHO’s more time-lagging distribution of live reference viruses. Dr. Flatt says that SGI, through its supported research at JCVI, has developed a “one-pot, isothermal method to assemble pieces of DNA rapidly and accurately.” SGI is applying the platform to develop cyanobacteria for production of products ranging from biofuels to food and feed ingredients. Scientists at JCVI and SGI are also developing what they describe as a pioneering methodology to transplant whole genomes into recipient cells. 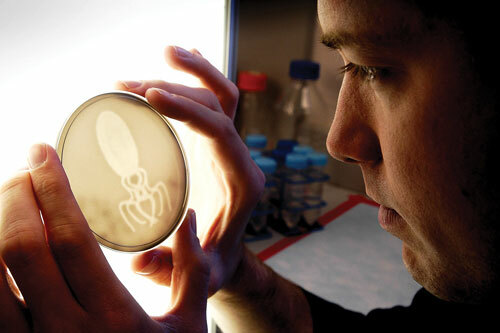 SGI says its milestones to date follow its predicted trajectory of the commercialization of synthetic biology products. “The first products will likely be synthetic genomic tool-based products that facilitate more rapid, cost-effective synthesis and assembly of DNA molecules for both research and commercial purposes. Soon thereafter, we expect to see seasonal flu vaccines, developed from commercialized vaccine seeds,” says Dr. Flatt. Synthetic biology in theory is limited only by imagination and one’s persistence in developing a technical platform, notes Laura Dress, CEO of Bridge, a synthetic biology communications consultancy. In those terms, “DNA art” has, in fact, moved from the realm of science fiction to feasibility, with such developments as those by undergraduate students participating in the annual iGEM (International Genetically Engineered Machine) competitions. Since 2003, with the first competition at MIT, the undergraduate synthetic biology forum has encouraged open sharing of DNA constructs and synthesis methods, with the concurrent goal of establishing a Registry of Standardized Biological Parts. The idea is to have an open platform of known genetic functions (essentially cassettes of gene functionality) that can be cleverly combined to render whatever feasible phenotypic results one might wish. For example, a University of Texas at Austin 2005 iGEM team constructed an E. coli strain with heterologous phytochromes to render a plate of bacteria that functioned as a pseudocamera: any pictorial image laid atop lawns of the bacteria would, after light exposure over time, be accurately reproduced, with each E. coli cell essentially acting as a lighted pixel, and the lawn as a whole properly depicting gradations of light and dark. Another team in 2006 engineered E. coli such that, during an exponential growth phase, it produced a wintergreen scent, and during stationary phase, a banana scent. A 2008 team developed a beer-producing strain of S. cerevisiae that co-produced the anticancer and anti-inflammation compound resveratrol, a plant compound found on the skins of grapes and in other plants. Slovenia, winner of the BioBrick Trophy: The team designed a new platform comprising a DNA-guided scaffold that could arrange various functional protein domains in a defined linear order. They designed chimeric violacein biosynthetic enzymes with added zinc finger DNA binding domains and showed that in the presence of a correct DNA program, the yield of violacein production could be improved sixfold and formation of side reaction product deoxychromoviridans could be suppressed. Slovenia submitted 151 parts to the registry, which can be leveraged with this DNA-guided platform for biosynthesis, building oscillators, characterizing DNA binding domains, etc. It also won awards for the Best New Application Area and Best New Engineered BioBrick Part or Device. Peking, 1st runner up: The team developed a strategy for heavy metal bioreporter and bioabsorbent engineering based on reverse-engineering principles. Peking also won the Best Environmental Project award. BCCS-Bristol, 2nd runner up: The team created agrEcoli, a device based on modified E. coli bacteria that detects and signals the presence of nitrates. BCCS-Bristol also won the Best Food or Energy Project award. Finalists also included University of Cambridge, Imperial College London, and Delft University of Technology. Best Project awards were given in each of the following tracks: Health or Medicine (Tie between Washington and Freiburg Bioware), Information Processing (tie between ETHZ Basel and Tokyo Tech), Manufacturing (MIT), Foundation Advance (Paris Liliane Bettencourt), and Software Tool (USTC Software). But while such possibilities for synthetic biology are impressive, in practical application the bioindustry is focusing on less glitzy functions to address basic consumer and industry needs. Bridge is currently working with Lumin, a company formed to expand on a 2006 iGEM team’s project. Lumin has engineered an E. coli strain for use in a handheld biosensor to detect the presence of arsenic in drinking water supplies in developing countries. Lumin’s platform combines a natural E. coli arsenic detoxification pathway with a portion of the well-known lactose metabolism system. The system is constructed such that various promoters act in concert to render the lac gene as a reporter that indicates the level of arsenic in water supplies according to the pH of the test solution. Verdezyne focuses on creating synthetic gene libraries instead of single-gene manipulations to introduce diversity of enzymatic function into metabolic pathways for large-scale industrial fermentations. “Enzymes from diverse sources show wide variation in kinetic properties that may not adequately predict their performance in a recombinant microbe, so rational selection of the best genes encoding a metabolic pathway still remains a challenge,” says Stephen Picataggio, Ph.D., CSO. Earlier this year, the company reported proof of concept in production of adipic acid (a precursor to nylon) with the engineering of a feedstock-flexible yeast strain capable of utilizing sugar, plant-based oils, or alkanes. The company estimates that its platform could realize a 20% manufacturing-cost advantage over traditional petrochemical production of adipic acid. Verdezyne also entered a collaboration earlier this year with Lallemand Ethanol Technology, a producer of yeast for the biofuels industry, to develop and commercialize a high-yield ethanol-producing strain. Evolva is currently collaborating with research groups from the University of Copenhagen, the Danish Technical University, Danisco, and Lawrence Berkeley National Laboratory on several research projects. For Evolva’s part, the company is engineering S. cerevisiae for production of the flavor ingredient vanillin, while Danisco is studying arabinogalactan proteins such as gum arabic, which has industrial use as a food stabilizer and in textiles, printing, paints, and cosmetics. Evolva just expanded a research collaboration with Abunda Nutrition for production of undisclosed “high-value” food ingredients. An ongoing partnership with Roche is focused on oncology and anti-infectives. The company’s own pipeline comprises compounds for cardiovascular and renal disease, invasive and topical fungal infections, and influenza and hemorrhagic fevers. Modular Genetics recently received NSF funding to apply synthetic biology for production of biodispersants—biologically produced, potentially less toxic alternatives to dispersants like Corexit®, which was used for the recent BP Gulf of Mexico oil spill but has been banned from use elsewhere in the world. Modular Genetics and its research partners at Columbia University, Iowa State University, and Louisiana State University were awarded a one-year $200,000 grant to support production and testing of biodispersants based on soybean feedstocks. The company is applying its in-house automated system for microbial-strain engineering to “rapidly develop a collection of novel, highly engineered microbes that can synthesize biodispersants,” notes Kevin Jarrell, Ph.D., CEO and co-founder. Modular biodispersants are intended to draw on underutilized agricultural waste material and are expected to be more readily biodegradable and less toxic than the chemical dispersants currently used, according to Dr. Jarrell, who highlights again the necessity of computer-aided design and high throughput for commercial synthetic biology efforts. Ultimately the goal is to render green products “made from totally renewable materials by engineered organisms that are purified with environmentally clean methods—potentially using just energy, water, and alcohol,” Dr. Jarrell says. As all these synthetic biology companies note, commercial deployment is, in fact, either already well near commercialization or actually under way. Amyris has applied its synthetic biology platform to create microbial strains that produce artemisinic acid, a precursor of the antimalarial compound artemisinin. The company bestowed a royalty-free license to the technology to Sanofi-Aventis which intends to distribute artemisinin-based antimalarials by 2012. 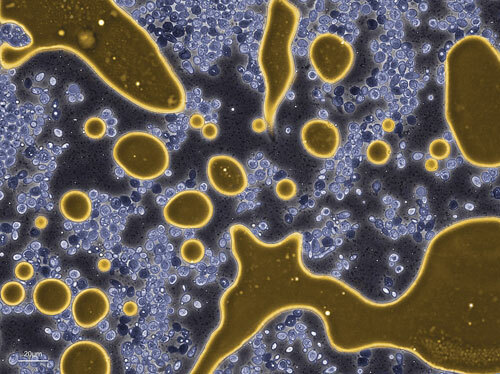 Amyris yeast (colored blue) producing and excreting BioFene™ (gold), the company’s precursor to biobased diesel and chemicals: The BioFene accumulates as an oil and separates from the water phase. 1 Synthetic biology products based on engineered pathways have in fact long been in commercial use (e.g., enzymes for detergents). 2 Synthetic biology employing wholly de novo constructed organisms has been demonstrated in proof of concept but is still several years from commercial scale. 3 The field is defined by digital design of species-agnostic phenotypic functions, high-throughput identification of function (to design specifications), and large-scale production and purification of end products (cells or cellular components). 4 In practice, synthetic biology is largely focused on “reading” DNA and on small-scale demonstration projects. The establishment of truly high-throughput DNA “writers” (DNA printing machines) should markedly accelerate commercial possibilities. Previous articleNewGene to Provide NimbleGen Sequence Capture Services in the U.K.